This wireless switch is a cost-effective device with WI-FI control module, no programming, only need to download an APP and link WIFI then can control the own cloud. As long as the module links WIFI, the connected appliances of different types and brands can be controlled via phone APP EWeLink from anywhere anytime in the world. Meanwhile, by setting timing schedules for your appliances and sharing control your smart home together with your family, you can maintain an carefree life. *Supports WiFi network. Supports numerous WiFi smart switches on one smart phone. *Supports status tracking: device status timely provided to the EWeLink. *Supports remotely turn on or off connected appliances, for example light, electric kettle, electric rice cooker, electric curtain/door, reversing motor, etc. 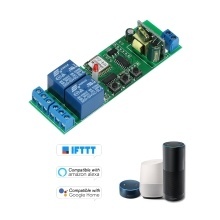 *Voice Control: Compatible with "Amazon" Alexa/for Google Home/Nest, IFTTT.